The Future is Urban Mugo Kibati said urbanization is the future, the world over, and it will happen without proper planning, Vimal Shah said that while Kenya is currently about 30% urbanized, by 2030 Kenya (which is just 212 months away), this will have risen to an urbanized population of about 75% urbanized. Are they going to stay in poorly planned cities or better-articulated developments? What is it? 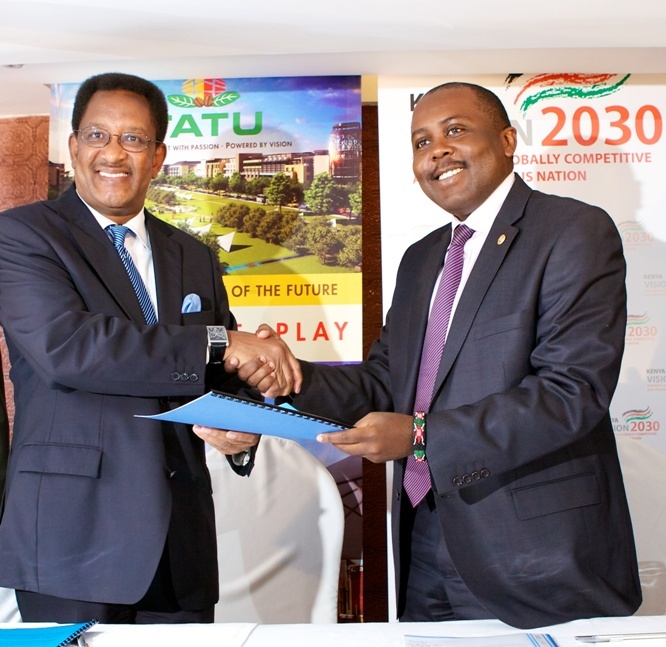 Dr. Gituro Wainaina, who is one of the Vision 2030 secretariat directors said that the message must get out that Tatu is not a gated community, it is where you work or where you sleep. Later it was mentioned that it was a brand new city, that will complement, not replace Nairobi, and at completion will be worth $5 billion – the single biggest FDI injection. It looks new and different from other projects (every toilet in Tatu City will flush with recycled water. Every roof should harvest rainwater!) and the Ruiru Council has embraced the project, are building capacity to manage with Tatu and are are going to reap the benefits of the project, which might lead other municipalities and counties to do that. Vision 2030 is not about Government Projects: Mugo Kibati said that Vision 2030 is not about government projects and they envision that the majority of projects will be by private investments or government partnerships with the private sector. He said that the Government is only meant to be a facilitator that provides incentives – adding that with Tatu on one hand and the government’s planned technology city in Konza on the other, he is watching the race to see which will complete theirs faster – the public sector or the private sector? Is Tatu is Destroying Farmland? At a time when the country can’t feed itself adequately, this has been partly attributed to the use of land has been attributed to land use Mugo Kibati said that current 60% farmers in Kenya, are feeding about 80% of the citizens. In future, the government would have to make some harsh decisions about denoting land as agrarian, commercial, residential etc. (in a Land Use Masterplan). Having a 70% urban population in 2030 will still leave 30% in rural areas which is still high. The current subdivision of arable land is unsustainable, and the government has to get more people out of farms and find them employment in other sectors; this will leave arable farming to farmers, who will mechanize, and invest in-agro business; i.e. Farming should be done by professionals, as it is in developed countries like the US that are able more than feed their countries and export surplus with less than 5% of their population being farmers. M-Tatu Mortgage? : Nyagah challenged James Mwangi, the absent chairman of vision 2030 (who’s also the Equity bank CEO), to create to create a mortgage, where someone can repay a daily amount e.g. kshs 500 per day and buy a house and name it M-Tatu. This entry was posted in Kenya real estate, local government, Vision2030 on September 15, 2011 by bankelele. The finances for the Nairobi City council showed revenue of Kshs. 8.1 billion ($123 million) which came from the following sources; government 2.53 billion, (Nairobi) water company 147m, borrowing of 505m, 772m from business permits, market fees 325m, 1.72 billion ($26m) from property rates, and 649m from parking collections. The popular and celebrated town clerk John Gakuo (who’s vilified by others) remains in office despite a change of guard in the chaotic politics of running Nairobi City. Also, the local government minister published new accounting rules last month for councils to follow which they must as they on average get about 60% of their revenue from the government, and most are dependent on the Government (taxpayers) for their continued operations. This entry was posted in John Gakuo, Kenya taxation, local government, Nairobi City Council on August 15, 2008 by bankelele. The outcry from President Kibaki’s decision to return the Amboseli Park to the Masai community prior to the 2005 referendum was probably influenced by the impression that community was incompetent and would run down Amboseli reserve in no time. But the Masai Mara, Samburu, Baringo and other reserves are all run by local communities and rather successfully – even from before Kenya got its independence (in 1963). Roads: You need a true 4WD to get around the Mara which can get muddy and flooded when it rains. There is some serious road repair work going on, and roads inside the park are generally better than those leading to the park. However, I get the feeling that it doesn’t bother the tourists as much as it does locals (vehicle owners, hotel suppliers, tour operators) since it’s all part of their TIA experience. 0 – Number of lodges that will be constructed inside the Mara as the council feels it is too crowded. Hence new projects are coming up along the fence or just outside the Mara. This entry was posted in Kenya domestic tourist, local government, Masai Mara and tagged Wildlife on April 27, 2007 by bankelele.